As the frenzy of the crypto markets constantly reaches new peaks, just using the right buzzwords is sometimes enough to get investors on board. 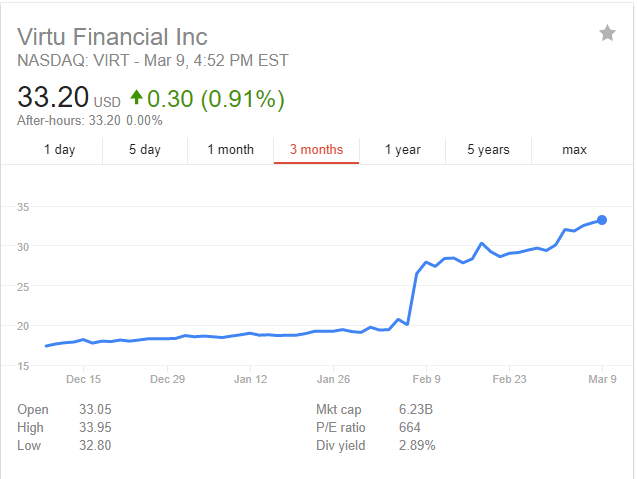 Now, a Wall Street high-frequency trading firm, Virtu (NASDAQ:VIRT) has become the target of a scam. The firm itself denied all relationship with crypto coin trading, and soon afterward the Virtcoin site was taken down for illicit activity. The news comes after a phenomenal bull market both in stocks and digital currencies. Virtu noted a robust increase in its quarterly earnings in 2018, with an increase of 168% in Q4 compared to the same period of 2016. Meanwhile, on the crypto markets, trading also saw an amazing last quarter of 2017, seeing Bitcoin appreciate to nearly $20,000. Virtcoin was a shot in the dark, an attempt to use the reputation of an already established company to potentially draw in investors. Because crypto trading has become one of the hottest trends in 2018, promising potential fast gains, using the name of Virtu seemed like a good idea. All the materials belonging to the project have been scrubbed from the internet, including the cliche-riddled white paper. The Virtcoin scam was supposed to ride onto the fame of the Virtu trading company, and potentially invite backers with a cloned site. The VIRT digital asset was advertised last week, in a bogus PR message impersonating Douglas Cifu, the CFO of Virtu. In the message, the scammers announced the upcoming launch of the VIRT token for the trading desk of the company. Because tokenization is nothing new, and trading platforms are often appearing as ICO projects, such a proposition is not so outlandish in the crypto world. But the announcement was a bit too direct, and some became skeptical. At the moment, Wall Street firms are very careful about direct involvement in crypto coins, and prefer derivative instruments. So issuing a token would be a bit too bold of a move for a trading firm. The Virtcoin scam happened too fast for the crypto community to react. The newly created VirtCoin Twitter account was inactive, and besides, the day that the news of the scam broke, the crypto market was undergoing a very unfortunate crash. So the attention for Virtcoin was relatively small. And yet so far, few crypto companies dared to impersonate big Wall Street firms, mostly out of fear of raising skepticism. Crypto scams usually get monitored closely by the community, but this time, the focus was on other projects, and Virtcoin was just a blip on the radar and a minor cautionary tale. Virtcoin was a simple scam related to an ICO – and those types of scams are becoming more numerous. One wonders why a well-established trading firm would go out of its way to raise funds in what is more suited to raising venture capital. Right now, the long-awaited, high-publicity ICO of Telegram is seeing a similar treatment. True, the Telegram chat app decided to release its own legitimate token. However, there are numerous sites offering to sell the token. Usually, copied profiles and credentials are the most common attempts to divert crypto funds, and those continue even now, affecting several ICOs. Yet the Vertcoin attempt remains a bit different in targeting a high-profile firm. There is yet another move linking traditional business to crypto coins, but it is in the provenance of OTC small cap stocks. Companies build on the blockchain hype, where just adding the word works to attract investors. Additionally, MLM schemes advertised to those new to crypto coins also rely mostly on the buzzword. Virtcoin was a scam that wanted to bring naive outsiders to buy into the crypto craze. Wall Street is extremely cautious when it comes to even touching Bitcoin. At the moment, despite the availability of Bitcoin futures, only a handful of firms is offering settlement services for the highly volatile asset. And while Virtu looks like a good match for the fast crypto market, it is dubious if it would enter outright trading through exchanges where spoof orders are the norm, and volumes dwindle or spike with no prior notice. So if a big name starts talking about blockchain, and mostly if there is an invitation to invest immediately, it is best to stay away. There are myriads of investment and trading opportunities, and the sector is very young. There is no guarantee that a big name would be more successful in the crypto world in comparison to a small startup or a project arising not from the world of finance, but from the world of crypto enthusiasts. At this point, the mainstream investor community is even more surprised than crypto traders. It is unknown why Virtu was picked out. The stocks' market price has appreciated rapidly and suddenly in the past three months, trading at $33.20 and seemingly unaffected by the news of a faked digital asset. The stock has appreciated by more than 30% in the past month, potentially attracting attention to itself.